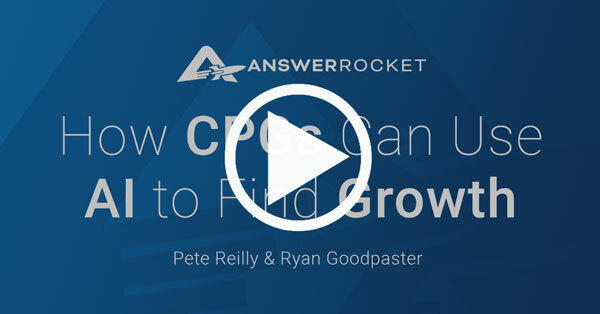 In our latest webinar, How CPGs Can Use AI to Find Growth, AnswerRocket VP of Sales & Marketing Pete Reilly shared how these shifts can be mitigated through augmented analytics. Consumer insights leaders, brand managers, and marketers can use machine learning and AI to more quickly identify growth opportunities and react in the marketplace. “A competitive advantage is gained by how you uniquely combine AI and data elements to find growth faster than the competition,” said Pete. Account Executive Ryan Goodpaster demonstrated AnswerRocket’s latest AI capabilities. “We’re taking the data, we’re running a bunch of statistical modeling and analysis, and on the front end, we’re using AI to parse natural language,” Ryan explained. Ryan also shared how to combine point-of-sale data with syndicated data to show how CPG brands are doing against their competitors. Watch the replay of our webinar, and request a demo if you’d like to learn more about AnswerRocket’s capabilities.